Dr. Thompson brings you practical tools to use in everyday practice when it comes to feline dermatology, including tips for identifying the right diagnosis and specific disease components. A cat’s job in life is to question all the rules and make us—veterinarians and pet owners—scratch our heads and puzzle over why they are acting a certain way or doing the things they do. The goal of this article is to provide tools to use in everyday practice, specific disease components to recognize, and tips to help identify the right diagnosis when we are faced with feline dermatologic challenges. Visible evidence of dermatitis or inflammation, such as papules, crusts, erosions, erythema, and scaling. But what about cats whose only clinical evidence is alopecia, and whose owners never witness them grooming? For these cats, the best plan is to approach the case similarly to the way you would approach a case of feline pruritus, even if the pruritus itself is not the primary presenting complaint. In many feline pruritus cases, the causes can be broken down into a few categories. If you evaluate the patient based on these categories, a diagnosis can be made greater than 90% of the time. Other: Neoplasia (T-cell lymphoma, thymoma), hyperthyroidism, drug eruption, and pemphigus foliaceus. Feline eosinophilic granuloma complex (EGC) is a dermatologic term used to describe a reaction pattern in cats—clinical and histologic lesions suggestive of underlying allergic skin disease. EGC consists of indolent ulcers (rodent ulcers), eosinophilic plaques, or eosinophilic granulomas. 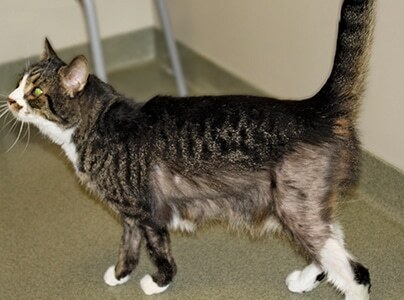 Psychogenic alopecia is frequently misdiagnosed because the diagnosis is based solely on the clinical appearance of the cat (symmetrical alopecia with no visible signs of erythema, papules, pustules, or scale). However, remember that excessive grooming is more often a result of pruritus than an obsessive-compulsive disorder. In a recent study, 21 adult cats with a presumptive diagnosis of psychogenic alopecia were referred to a behavioral service.1 In 19 cats, a cause of pruritus was identified: adverse food reaction was the most common cause, followed by parasitism, flea allergy dermatitis, atopy, and hyperthyroidism. Therefore, psychogenic alopecia is a diagnosis of exclusion, which should only be considered after all other causes of pruritus have been eliminated. Age of onset: If the patient is less than 6 months old at onset of clinical signs, parasite hypersensitivity and dermatophytosis are the most likely causes. In geriatric cats, typical causes are hyperthyroidism, T-cell lymphoma, and thymoma. Seasonal components: If there is a strong seasonal relationship with extended periods of normalcy, consider atopy, flea allergy dermatitis, or insect bite hypersensitivity. Remember, though, that atopy can be nonseasonal, with year-round clinical signs present. Lifestyle factors: Variables, such as recently introduced animals in the home (Figure 1), access to the outdoors, travel, and house guests, put cats at increased risk for contagious causes of pruritus. Response to corticosteroids: In general, atopy is considered highly responsive to steroids, while food allergy is less responsive. Many ectoparasitic causes of pruritus are minimally responsive to corticosteroid therapy. However, there will be exceptions to these typical findings. Figure 1. Buster, a 14-year-old neutered male domestic shorthair, with a 4-month history of intense pruritus. Buster was 1 of 9 cats in the household. Five months prior to presentation, a new cat from a shelter had been introduced into the home. See Figure 2 for diagnosis. 6. Fungal culture (dermatophyte test medium) and Wood’s lamp examination (dermatophytosis). Figure 2. Skin scrapings from Buster revealed Demodex gatoi. 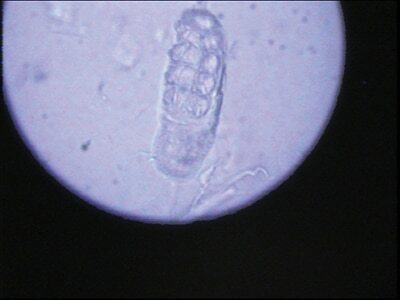 Superficial skin scrapings are needed for the identification of Demodex gatoi, Cheyletiella, and Notoedres mites because these mites reside on the surface or superficial layers of the skin. Cheyletiella mites, also referred to as “walking dandruff,” can also be found via a good flea comb or acetate tape prep. A parasite “vacation” is recommended for all pruritic or alopecic cats, even those that are not perceived as pruritic by their owners. Remind owners that the absence of parasites during initial examination and diagnostics does not eliminate them from the differential list. See Table 1 for a list of products to use for parasite elimination. *Applying these products at the treatment intervals recommended above is considered off-label use. Change food dishes from plastic to ceramic, glass, or stainless steel, which is my preference due to the potential for hypersensitivity to plastic. Remove other food dishes after feeding to prevent the patient from licking a dish that may contain offending protein(s). Discontinue the following items during the trial: cat grass, catnip, flavored flea prevention, hairball supplements, treats (including dental treats), and omega-3 fatty acids (fish is a common dietary protein in cat foods). Advise the owner to mix small amounts of new diet into the previous food, gradually increasing the amount over a 4- to 7-day time frame. If the cat consistently eats the previous food, leaving the elimination diet, a different diet will need to be chosen. Food trials are not truly complete until the cat has been challenged with the previous food and the clinical signs recur. However, some owners will be resistant to discontinuing the new diet if the cat’s clinical signs have resolved. A home-cooked diet composed of a single protein source and a single carbohydrate source is still considered the “gold standard” of dietary trials. Home-cooked diets limit the chance of contamination with other proteins or additives. These diets require considerable effort on the part of the owner. Novel protein sources, such as elk, venison, kangaroo, rabbit, and horse, can be difficult to purchase in large quantities on a reliable basis, and these specialty meats can be expensive. Feeding cats an unbalanced diet, especially with regard to taurine, is a concern, even for a limited amount of time. For these reasons, I prefer to use a prescription novel protein or hydrolyzed protein diet during the dietary trial. It is important to realize that neither intradermal skin testing nor IgE serology is used to diagnose atopy. Rather, diagnosis is determined by clinical history and ruling out other causes of pruritus. Specific allergen testing identifies environmental allergens that are best suited for inclusion in allergen-specific immunotherapy (ASIT) injections. The goal of hyposensitization is to, over time, decrease the severity of hypersensitivity reactions to specific environmental allergens (Figures 3 through 5). Figure 3. Brandi, 3-year-old spayed female domestic shorthair, with a 6 month history of persistent head and neck pruritus. There was no improvement in pruritus after parasite control and 10-week dietary elimination trial. Figure 4. Intradermal skin test performed on Brandi. Figure 5. Brandi’s neck 3 months after initiation of antigen-specific immunotherapy. Eliminate all manifestations of atopy. Some of the symptomatic therapies used in dogs, such as frequent cool water baths, menthol, and witch hazel sprays, are not well tolerated by their feline counterparts. In addition, prolonged use of topical corticosteroids, such as betamethasone, triamcinolone, and dexamethasone, can lead to severe adverse effects, including permanent skin thinning and fragility. Providing temporary relief of clinical signs. “Symptomatic” therapies range from use of omega-3 fatty acids and antihistamines to corticosteroids and cyclosporine. Antihistamines alone may be useful for mild pruritus (particularly atopy), but are most useful as part of combination therapy, such as use with fatty acids, to reduce the amount of corticosteroid required. As in humans, failure to respond to one antihistamine does not mean the patient will not respond to another one. It may be necessary to formulate an antihistamine trial, in which the owner tries different antihistamines for 2 weeks each in order to find one that may provide some relief. Antihistamines are quite safe with minimal side effects. However, although rare, there are documented cases of urinary retention in cats receiving antihistamines.3,4 Caution is warranted when administering antihistamines to cats with a history of urinary tract disease. See Table 2 for antihistamine dosages for cats. Microemulsified cyclosporine (7 mg/kg/day) provides an alternative to corticosteroids for cats that require long-term symptomatic management of pruritus. Cyclosporine has multiple mechanisms of action, ranging from inhibiting T-cell activation; histamine release; cytokine production; and eosinophil migration, survival, and degranulation. Do not want to pursue ASIT. Cyclosporine therapy has also become a more attractive option for owners due to the introduction of feline Atopica (ah.novartis.us). The liquid formulation provides ease of administration and flexibility in dosing, and it may be administered with food. Because fatal systemic toxoplasmosis has been reported,7 avoid cyclosporine use in cats with high risk for toxoplasmosis (eg, cats that hunt). Contraindications for use include demodicosis, neoplasia, dermatophytosis, and systemic fungal infection. Decrease the severity of hypersensitivity reactions. Immunotherapy, also referred to as hyposensitization therapy or allergy vaccine, refers to a mix of allergens administered via subcutaneous injection or sublingual drops, in progressively increasing doses. The formulation of allergens is based on the results of either intradermal skin testing or serologic testing in combination with the cat’s history, including seasonal flares. ASIT’s exact mechanism is unknown; most hypotheses suggest that modulation of the immune system by introducing proteins identified by testing as allergens (in dilute, yet increasing amounts) results in development of tolerance and, thus, eventual decrease in clinical signs. Time required to see a response to ASIT varies between individual patients: Some cats show a positive response in a few months, whereas others require several months. In general, owners are advised to continue ASIT for a full year before completely assessing benefits of therapy. Follow-up, client education, and compliance are critical to achieving maximum success. Owners should be taught to recognize patterns and levels of pruritus, as well as adverse reactions. Adverse reactions are typically mild and uncommon, but can include intensification of clinical signs for a few hours or days post injection, local reactions at the injection site, or rarely, anaphylaxis. Escalation in pruritus may indicate that the atopic cat has reached its maximum tolerance dose of antigen. 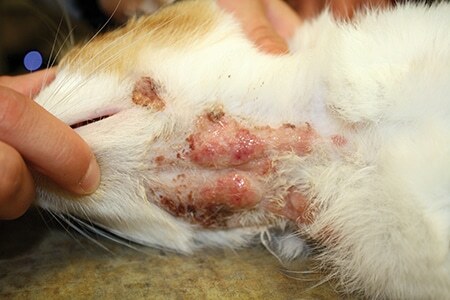 Identifying the underlying cause of pruritus via a thorough history, recognition of clinical signs, and appropriate diagnostics is crucial to implementing a successful long-term treatment regimen for the feline patient. Successful management of an atopic cat often requires a multimodal approach: Some therapies are long-term (ASIT), while others are used to treat acute flare-ups (glucocorticoids) or address secondary bacterial or superficial fungal infections. Systemic therapy is often combined with topical therapy for the best outcome. Waisglass SE, Landsberg GM, Yager JA, Hall JA. Underlying medical conditions in cats with presumptive psychogenic alopecia. JAVMA 2006; 228(11):1705-1709. Beale K. Feline demodicosis: A consideration in the itchy or overgrooming cat. J Fel Med Surg 2012; 14(3):209-213. Pfeiffer E, Guy N, Cribb A. Clomipramine-induced urinary retention in a cat. Can Vet J 1999; 40:265-267. Scott DW, Miller WH Jr. Antihistamines in the management of allergic pruritus in dogs and cats. J Small Anim Pract 1999; 40:359-364. Ferasin L. Iatrogenic hyperadrenocorticism in a cat following a short therapeutic course of methylprednisolone acetate. J Fel Med Surg 2001; 3(2):87-93. Lowe AD, Graves TK, Campbell KL, Schaeffer DJ. A pilot study comparing the diabetogenic effects of dexamethasone and prednisolone in cats. JAAHA 2009; 45(5):215-224. Last RD, Suzuki Y, Manning T, et al. A case of fatal systemic toxoplasmosis in a cat being treated with cyclosporine A for feline atopy. Vet Dermatol 2004; 15(3):194-198. Trimmer AM, Griffin CE, Rosenkrantz WS. Feline immunotherapy. Clin Tech Small Anim Pract 2006; 21(3):157-161. Lori Thompson, DVM, Diplomate ACVD, is the co-owner of Animal Dermatology Clinic Indianapolis, in Indianapolis, Indiana. Dr. Thompson’s clinical interests include allergic skin and respiratory disease, equine dermatology, and immunomodulatory therapies; she lectures nationally on these topics and is the author of several peer-reviewed articles. In addition, she is active in volunteer work and organized veterinary medicine. Dr. Thompson is the immediate past president of the Indiana Veterinary Medical Association and a past recipient of the ACVD Resident Research Award and Bastien Award for Excellence in Canine Care.